A treat of a tour on this 12 day Egypt and Jordan Historical Tour with a fascinating insight into Ancient cultures. Visit the Great Pyramids, Sphinx, Museum in Cairo, Nile cruise with tours to temples enroute. Then on to Jordan with the Ancient Nabatean culture. Book your Tour of Egypt and Jordan Today! On this Tour of Egypt and Jordan, you will arrive in Cairo to discover the contrasts of this ancient city both Ancient and Modern. Our Memphis Tours Representative will meet you at Cairo International Airport and then accompany you to your Hotel for check in with free welcome drink. Tonight, you have the chance to relax, explore, or take an optional excursion at the Pyramids for the incredible Sound and Light Show. After you will return to your Hotel and then the night is at leisure. 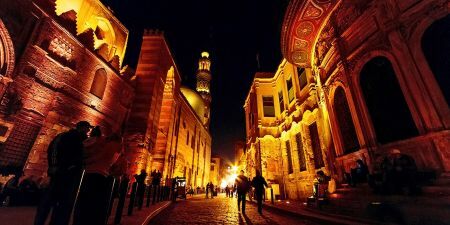 Overnight Cairo. Breakfast at your Hotel and then your private expert Egyptologist Tour Guide will take you to the amazing Pharaonic Cairo to visit the Step Pyramid and the Fine Tombs at Sakkara, the Statue of Ramses II and the Alabaster Sphinx at Memphis that was the ancient capital of Egypt during the Old Kingdom. From there you will be moved to the Giza Plateau to visit the Great Pyramids of Cheops, Chephren, Micerinus and the almighty Sphinx, the royal human head on a lion's body then to the Valley Temple, two huge megalithic Temples, known as the Sphinx Temple, and the Valley Temple traditionally attributed to the Pharaoh Chephren that is an absolute wonder of engineering. Lunch enroute at a specialty restaurant near the Pyramids with free time for shopping. Overnight stay in Cairo. * Please note - There is an extra charge to enter any of the Pyramids. Please speak to your Guide if you require tickets. Check-out after breakfast and then you will be taken for a guided tour to the Egyptian Museum of Antiquities that was built in the neo-classical style by the French architect Marcel Dourgenon, the Museum housing over 120,000 objects from different Pharaonic eras especially those of the child king Tutankhamen. Then after your full day touring, you will be transferred to Cairo Airport to fly to Aswan, where you will be met and assisted by a Representative and transferred to your Hotel in Aswan for free welcome drink upon arrival and check with free time in Aswan for overnight stay. Time to walk around lovely Aswan City and old Souk ( market). Enjoy your breakfast at the Hotel in Aswan and free time at your Hotel in Aswan with an optional excursion to Abu Simbel temples (Abu Simbel remains one of Egypt's top tourist attractions) to see the magnificence of these two Temples, the main Temple of Ramses 11 and the Temple dedicated to his wife Nefertari. They are undisputedly one of the world's most breathtaking monuments and Egypt’s second most visited tourist site (the Pyramids of Giza being on the top of the list) the most remarkable feature of the temple of Abu-Simbel is that the construction is oriented in a way that twice a year, the morning sun rays shine through the length of the inner temple cave and illuminate the statues of the Gods seated at the end of the cave illuminate the sculptures on the back wall,except for the statue of Ptah, the god connected with the Underworld, who always remained in the dark.Then you will be transferred back to your hotel for a peaceful overnight stay in Aswan. * Please Note: Other optional tours are available in Aswan to the Nubian Museum and Nubian Villages, Kitchener’s Island and Old Souk of Aswan City. 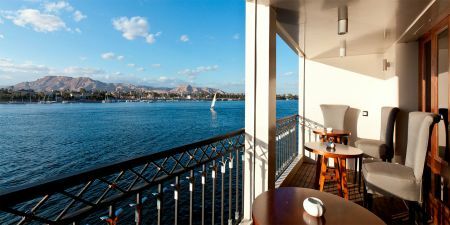 Breakfast at your Hotel in Aswan, Then you will be transferred to embark your Nile River Cruise in Aswan, where we will enjoy the next 4 days / 3 nights deluxe Nile cruise holiday between Aswan and Luxor. Afternoon time you will be accompanied by your Egyptologist Guide for an exciting tour to the world famous Aswan High Dam, an engineering miracle when it was built in the 1960s and contains 18 times the material used in the Great Pyramid of Cheops. Continue to the granite quarries which supplied the ancient Egyptian Pharaohs with most of the hard stone used in Pyramids and Temples. The quarries still hold the famous Unfinished Obelisk. Then you will be taken by motorboat to the island of Egilka to visit the majestic Philae Temple, a Nubian structure that was dedicated to the Goddesses Isis. There is a final optional evening excursion for the sound and light show at the Temple of Philae. Return to your boat for dinner with free time at leisure in Aswan and overnight stay aboard the cruise. Sail to Kom Ombo. After breakfast will be accompanied by your English speaking Guide to visit Kom Ombo Temple, home of the Crocodile-headed God of fertility Sobek, creator of the world, and Horus. Lunch and afternoon tea onboard your cruise with free time at leisure whilst sailing to Edfu to explore Edfu Temple of Horus, one of the best-preserved Ancient Egyptian temples on the Nile. 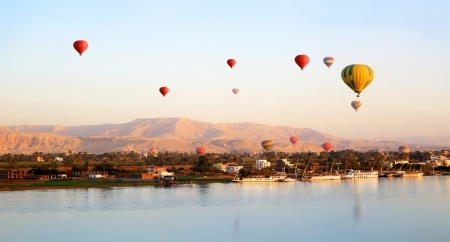 Continue the cruise down the Nile to Luxor. Dinner and overnight stay onboard cruise in Luxor. Breakfast on board your Nile cruise, then you will be taken over to the West bank of the River Nile to visit the Valley of the Kings, where the magnificent tombs of the Ancients were discovered (including the boy King Tutankhamun). These tombs were carved deep into the desert rock, richly decorated and filled with treasures for the afterlife of the pharaohs, you will visit 3 tombs. (The three tombs visited are determined by the Egyptian Government as to preserve them from the large flow of visitors, therefore are rotated throughout the year and cannot be confirmed as to which tombs prior to your visit). Continue the tour to visit the Hatshepsut temple at El Deir El Bahary, this impressive temple dedicated to the Queen Hatshepsut the only female pharaoh rises out of the desert plain in a series of terraces and merges with the sheer limestone cliffs that surround it. and then visit the two colossal statues of Amenhotep III (Colossi of Memnon). * Note: Optional tour of the Sound and Light Show at Karnak Temple. 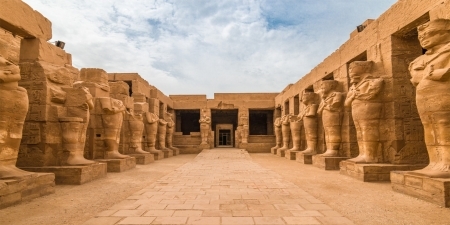 After breakfast on the boat, you will disembark the Cruise and be taken with your Guide to visit Continue your Luxor sightseeing tour to visit Karnak Temple, the largest place of worship ever built. Its ancient name Ipet-isut means “the most sacred of places.” The temple, or, more correctly, the complex of temples, was built over more than two thousand years by generation after generation of pharaohs. Within the complex, the great “Hypostyle Hall” is an incredible forest of giant pillars.Then you will be transferred to the majestic Luxor temple which built by Amenhotep III and Ramses II for ritual and festivals and dedicated to the god Amun. Then some free time for shopping in Luxor and then transferred to Luxor airport to fly to Cairo with direct transfer to your Hotel in Cairo for free time at leisure with overnight stay. Breakfast at your Hotel in Cairo and then you will be met and assisted by a Representative and transferred to Cairo international Airport to fly to Amman in Jordan. Upon arrival at the Airport in Jordan, our Representative will meet and assist you through the customs and immigration procedures. Transfer to the hotel in Amman for free welcome drink and check in with free leisure time in Amman and overnight stay. Breakfast, then with your Tour Guide and driver then driven to the town of Madaba, where you will discover the ancient wonder, a beautifully crafted 6th century Mosaic in the floor of the Old Greek Orthodox Church of Saint George, which is a map of depicting the biblical regions from Libya to Egypt. . After that, a stunning view of Mount Nebo, the location where the Holy Prophet Moses was said to have gazed across at the Promised Land. He is said to have been buried at this place. An old Monastery overlooking the Jordan Valley, along with the Dead Sea and parts of the Holy Land are the next stop on your tour. Finally, a drive to what is known as the lowest point on earth, the Dead Sea. Here you have leisure time and the chance to float on the famous water’s known to ‘float’ a person and not sink! Also, it is known for it’s mineral and mud properties for therapeutic benefits.Then you will be transferred back to Amman for free leisure time and relaxation. Overnight at your hotel in Amman. After breakfast, you will begin your day tour in Petra, the biggest most famous attraction in Jordan. Petra was a Nabatean Civilisation established around the 6th century B.C, a Nomadic tribe who settled in the area and laid the foundations of the Rock city. An option of horse ride or by foot to the Canyon, (the so called Siq), then by foot to the inspiring monument known as the Treasury. Other Monuments are the Street of Facades, the Royal Tombs and Pharaoh’s Castle. After the tour we will drive 2.5 hours back to your Amman Hotel. After breakfast, you will be transferred to Queen Alia International Airport in Amman for final departure. Per Person in Sterling Per Tour and can be paid in US$ or Euros by credit card via a secure payment system with no extra surcharge. Current prices are valid untill the 30th of September 2019 excluding Christmas Holidays. Children policy is applied to children who share rooms with their parents.If your tour package includes airfare then extra charges for your children may apply. Transport for all tours included: domestic flights, trains, and air-conditioned vehicles by road.Wi-Fi, Bottled water and ice box all included whilst travelling by road. All are new vehicles for the latest design and technology. Are available to assist you with transfers to and from Airports, Hotels assisting at Airports with Visa, tickets, luggage. All tours of the sites in Egypt include constant guidance of a highly qualified Egyptologist Tour Guide. ​​​​​​​Children delight in touring the Pyramids, Temples and Tombs in Egypt as often it is part of their school study programme. 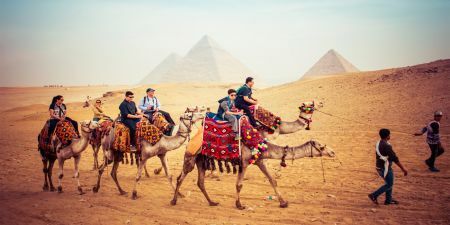 Memphis Tours offers packages to suit all ages with excellent combined multi-location destinations such as Cairo, Luxor, Aswan, Nile Cruise and the Red Sea Resorts. ​​​​​​​Specially adapted Nile Cruise boat MS Amarco 1 has all amenities for wheelchairs and special assistance customers on the boat and disembarking for tours. 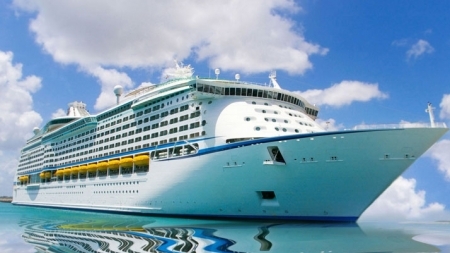 Assistance from the Boat Crew and Tour Guides are always ready and available.